An iffy port and inconsistent level design trouble an otherwise deep and challenging samurai action RPG. Nioh is hamstrung by a sloppy PC port, but still manages to bring new ideas to death-treadmill action RPGs. I’ve been down this cursed mountain path more times than I care to count. Each time, I’ve managed a stupider fatal mistake than the last. I’ve dodged away from literally nothing, falling to my death. I’ve been knocked off the same cliff by a bandit with a spear. I’ve anticipated spear guy, but too early, allowing him to poke me in the face. But finally, I make it to the end of the road. There’s a small hole in the cliff face to the left that I’ve been eyeing. As I approach, I don’t notice the squeaking that should have warned me, too thrilled with my progress. A cloud of bats fly right in my face, a flurry of teeth and wings and I’m suddenly stumbling off the cliff again. The time after that though, I manage to lure spear bandit in front of the bat cave and he’s the one tumbling off and the smarter person (me) is left alive. Nioh makes turning the blade on the levels themselves just as satisfying as parrying its host of decomposing demons. Nioh’s is an action game primarily about becoming familiar with enemy attack patterns, managing your Ki (read: stamina), and evading or blocking attacks while looking for an opening to strike. With a selection of samurai-themed weaponry, you’ll fight through gauntlets of enemies in pursuit of the boss at the end of each mission. Its environments are grim or stormy and levels require methodically exploring spaces to find shortcuts and secrets. Its enemies are weird and grotesque and boss fights are prolonged tests of patience and dexterity. Elevators are activated by switches in their floors. Doors inexplicably open from only one side. If this sounds familiar, we’re on the same page. I want to dodge away from framing Nioh only as “Dark Souls but samurai,” but I’ve enjoyed it so much specifically for the ways in which it elaborates on the deadly and demanding action combat that the Souls series popularized. 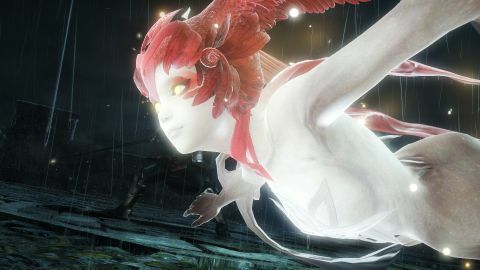 Nioh brings its own punch to the party by adding badass spirit animal summons, chaining combos, and fighting stances to a combat system that would have otherwise felt too derivative. Although the port to PC has a disregard for keyboard controls bordering on outright rude, Nioh's swift, layered combat was worth retraining my muscle memory for. All five weapon types in Nioh have a high, medium, and low stance that can be swapped at any time, each with its own attack combos and a different focus. High stance does more damage but is often slower while low stance reduces the Ki consumed by dodging and has quicker attacks. I enjoy how each weapon having so many possible combos might encourage experimentation but being the creature of habit I am, I stuck entirely to the kusarigama, knowing that my one tool was versatile enough to get the job done. Why try a sword when my sickle on a leash can handle anything I throw it at? Nioh’s combat stays fast-paced and gratifying, bringing a rhythm to fights that isn’t possible with only a lock-on-and-dodge system. One solution is to play “the floor is lava” and just deal with multiple AOEs piling up. The better option is a Ki Pulse. After attacking, there’s a short window to recoup some of the spent Ki with a button press. More importantly, a Ki Pulse can cleanse the influence of a Yokai Realm if it’s triggered while standing in one. Between swapping stances mid-fight and learning to weave pulses between my attacks to keep my Ki topped off, Nioh’s combat stays fast-paced and gratifying, bringing a rhythm to fights that isn’t possible with only a lock-on-and-dodge system. Tracking your enemies’ Ki, adjusting stances, and unlocking additional combos for each weapon all add extra layers to Nioh’s combat, turning it into a unique system rather than a borrowed one. And with all that extra complexity, Nioh does a great job meeting the standard for easy(ish) to learn and difficult to master. Nioh’s combat is dodgy, in a good way, but the levels can be touch-and-go. I was initially disappointed in the level design, but the zones get better throughout. The early levels—an abandoned village and mansion courtyard—rely on open spaces (looking at you, horrible mountain pass) where the end goal is often visible from the start, obstructed by a convenient swath of fire, a sheer cliff face, or a one-way door. Seeing the objective through the slats of a fence and knowing I’d have to dance through the labyrinth of angry demons and rooftops, I initially felt like I was being taunted, not tested. By the third and fourth missions, the plot descends into underground zones that were able to weave together connections between different segments of each level in more interesting ways. Jumping down into a previous tunnel through a hole I hadn’t originally noticed over my head is more satisfying than unlatching the opposite side of the door I wish I could have just kicked open. Enemy placement mostly adds to the effect by providing obstacles but few surprises. I’ve gotten the occasional jump scare from an unexpected demon, but rarely the euphoria when I anticipate the bandit with the bow was standing there to lure me onto a trap plate. Levels are loosely arranged to tell a thin story set in Japan. England and Spain are fighting over some mythical power source called Amrita. William—formerly a pirate hired to locate the stuff—escapes the Tower of London, is separated from his guardian spirit by a guy with serious tattoos, and spends three years on a ship before landing in Japan where he inadvertently becomes the first western samurai. Nioh’s William is an Irishman, but he’s based on William Adams, the first English sailor to land and subsequently get stranded in Japan. The history is interesting but Nioh mostly just uses it as half-hearted character motivation rather than imparting anything really cool. There’s a weird tonal mismatch between serious samurai stuff and these shiny, pastel spirits that William sees floating over everyone’s shoulders, apparently a side-effect of his Amrita-tracking abilities. Also, there’s a guy who keeps a cat in his coat. A real cat, not a spirit cat. There’s a spirit cat too, though. It’s Japan so the cat quotas must be met. Nioh’s PC port lacks any reasonable support for typical desktop peripherals, but it’s playable if you’re willing to spend some initial time adjusting. The resolution settings are only accessible in the launcher, not the in-game settings. Fortunately, pressing “play” on Steam now defaults to opening the launcher, not skipping it, an update which appears to have happened on release day. The keyboard controls, as some kind of sick joke, are only listed in a PDF manual. But the keyboard controls, as some kind of sick joke, are only listed in a PDF manual, also found in the launcher. You’ll want that manual handy because despite supporting a keyboard (but not mouse controls), the entire interface will still display controller buttons in the menus and action prompts. Fortunately for me, I’ve always used controllers in action games. Unfortunately for me, I wasn’t a fan of the default control scheme or any of the alternatives. Even after customizing mine, Nioh still displays the default button prompts in-game. I refuse to say how many times I’ve dodged to my death because I swapped the action button and dodge button. It was several hours before I managed to stop reflexively pressing the prompt shown on screen. Be warned, swapping buttons in the control layout also swaps them for their menu uses, the cherry on top of an inconvenient sundae. The good news is that even though Nioh forces you to cap your framerate at either 30 or 60 fps, I get a steady 59 on my mid-range system with all graphical options set highest. I only drop into the 40s during boss fights with particularly busy environment effects and during cut scenes which are rendered at 30 fps. It’s not of inspiring quality, but is serviceable enough given that Nioh’s face isn’t its main feature. Nioh’s versatile and rhythmic action combat makes getting through each mission worthwhile. I haven’t taken full advantage of the possibilities offered by the various weapons and combos, but I know others will enjoy crafting and testing builds. And after finishing the main quest, Nioh offers twilight missions (harder versions of completed missions), clan battles, a Diablo 2-style loot grind, and a new game plus to tackle. It's massive, and most of it is worth seeing, some stinker levels aside.